There are so many different pairs of high-quality Bluetooth earbuds on Amazon that are affordable, it seems crazy at this point to spend $100 or more on earbuds from brands like Beats. You can get the same quality and battery life for much, much less money, and today’s deal is a perfect example. 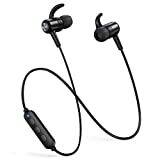 The TaoTronics Magnetic Bluetooth Earbuds typically cost between $28 and $30, but they’re on sale today on Amazon for just $24 if you buy them in black. But wait! Use the coupon code OY88FQCI at checkout and you can snag them for only $15.99.